The fire is now out and we have closed the incident. There are no more updates to follow. Surrey Fire and Rescue Service would like to thank crews from other fire services and the other emergency services for their assistance and all the volunteers who supported them in difficult conditions. As the weather is set to remain warm and dry Surrey Fire and Rescue Service is urging people to enjoy the countryside safely. More video footage showing the extent of the damage and firefighters tackling the wildfire in Pirbright. A Surrey Fire and Rescue Service spokesman said “We still have a large amount of equipment and around 50 firefighters working hard in hot and difficult conditions to tackle this incident and damp down the area. 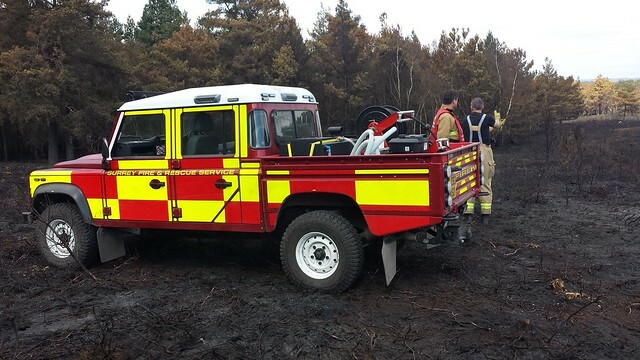 Assistant Chief Fire Officer Steve Owen-Hughes provides an update to BBC Surrey on the situation at Pirbright. A Surrey Fire and Rescue Service spokesman said: “We will be scaling back operations overnight to two fire engines and a couple of specialist vehicles. Crews will be holding a watching brief and continuing to damp down the fire during the night. 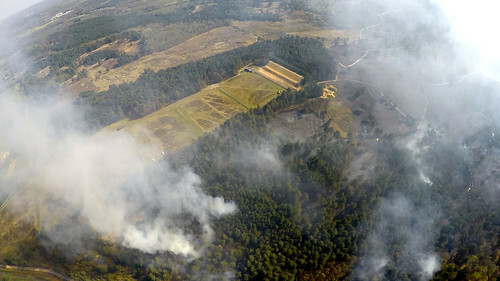 The wildfire spread across 30 hectares of heathland, which is equivalent to over 42 football pitches. It has now been brought under control by fire crews. We will provide updates on this site when available.